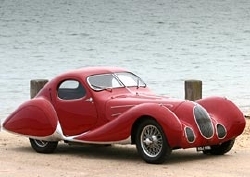 The Talbot Lago coupe with coachwork by Figoni & Falaschi could be considered the “Great-Grandfather” of the Talbo built by TLC Carrossiers Inc. and now being built by GC Carrossiers LLC. The Christie auction held during the Pebble Beach Concours d’Elegance Aug 18 ,2005, featured the Figoni & Falaschi Talbot Lago once owned by designer Brooks Stevens. It was sold for $3,535,000. The RM auction the next day had the long wheelbase Talbot Lago which sold at $3,685,000. When this car was at Brooks Stevens Museum, Brooks permitted me to measure and take the lines of the car. The Talbo is a interpretation of these fabulous shapes adapted to provide a modern sports car. Brooks visited our facility after we had built several Talbo’s and was very enthusiastic and supportive about the Talbo. 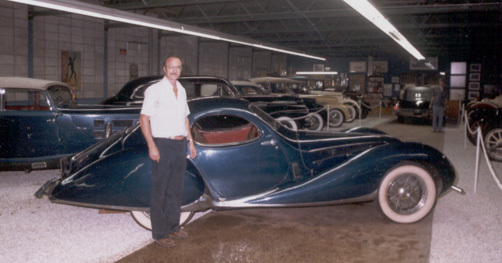 The picture below from the early ’80’s shows the car in Brooks Stevens museum in Mequon, Wisconsin. 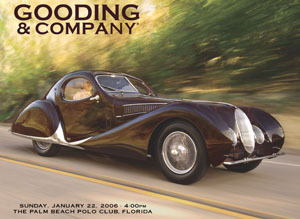 Another Original Talbot Lago Figoni et Falaschi coupe was the “cover girl” on Gooding’s Auction at the 2006 Palm Beach Concours d’Elegance. This stunning automobile was auctioned for almost Four Million US Dollars.